Kinda makes you wonder, doesn't it? 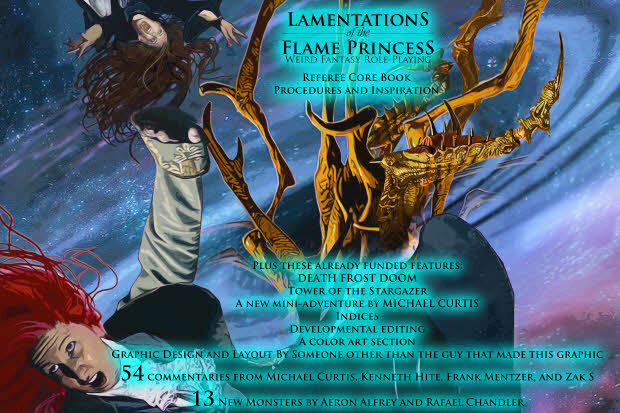 The LotFP Weird Fantasy Referee Book funded on October 17, 2013 and James Raggi gave himself a due date of January 2019. Five years and three months time. And still, he has failed to deliver on time. Being honest... a great many crowdfunding campaigns greatly underestimate the time it takes to get the projects together and to the backers and end up being late. LotFP still has some stuff outstanding that's past deadline. Guessing a "real" date seems like a losing proposition. But the Ref book is essential to LotFP as a game and as a business, and the company is basically in neutral gear until it's done. So it's in everyone's interest to get it done in as timely manner as possible. And we will do our best not to drag our butts. But we won't cut corners. Layout for the Rules & Magic book took longer than expected, but the same template will be used for this book so who knows how that will affect things. We might hit some of the stretch goals that affect the book's content (more art, color layout, developmental editing), and those will add unknown amounts of time to the project. Someone pointed out in the run-up to this campaign that "You mean if 50 people add on commentary by Zak, he's going to write 5000 words?" and if that happens to one (or more...! One can dream...) of the commentators, that might add more time in. While all of these things add time to the project, they also make the book better. And I hope they happen and will push for them to happen, but at the end of the day the people doing most of this stuff are freelancers who will need to fit this book into their schedules at the time it's ready for them. Five plus years is a long time to develop any project. Earlier tonight, Ken Hite stated: "I will, however, not work with Zak on any future projects, knowingly share a credits page with him on any future projects, or increase his social media reach." That's going to be an interesting conflict. Last update on the project's page was in July of 2018. I see on the comments section that the requests for refunds have begun. No comment about *why* Ken won't work with Zak anymore? Last update was 13th January 2019 via the Tubes. I backed this all in, never expecting it to take the hilarious 5 years James was postulating, but I've backed and bought everything since and will continue to. If it takes another 5 years, I'm okay with that. I'd also be interested as to the Ken/Zak beef sandwich. Purely for the drama you understand. Vampire related? All this mentioning of Zak, but nobody mentioning the lead story. Ken will not work with Zak because of recently publicized information about Zak's previous relationships. Mandy, Zak's ex, posted a statement accusing Zak of having been a horribly manipulative and abusive person while they were together. She posted accompanying statements by two other women to support her claims. Mandy provided specific instances and is not known for being a drama queen or "professional victim", so her statement is seen as credible. Zak has not yet responded in detail (as far as I have seen), other than to state that Mandy's claims are not accurate. I'm sure the situation will become more clear as time goes on. Raggi never seemed like the most with it guy to me, so I'd never give him money anyhow, but it doesn't sound like people are ready to string him up yet, so is he further ahead than Skarka? Definitely doing better than Whitman. I can;'t imagine a justification for making a game book for an existing game for five years, though. Oh, and Zak sounds like a winner, the kind of person who gives our hobby a bad name sometimes. Never met him to say, though. I'd be happy to see an update, but Raggi has a history of coming through in the end and exceeding expectations, so I'm not angsty about it. What's going to stop Zak from pulling Gareth? I refuse to buy Modiphius now because of Gareth's stunt there.. I backed the Referee Book all the way. Did I suspect it would take five years to finish? Probably not. Am I mad at James? No. He was pretty upfront that the book would be finished when it was finished. I suppose one factor is that after x years James feels the book needs to be awesome, not just good. And, yeah, even if it was basically finished right now, he might want to let some of the dust from the Zak controversy to settle before bringing it out. I would definitely like to have the book in my hands right now, but let’s be honest, if you’re running a LotFP game, the Rules & Magic core hardcover is almost a stand-alone product; and if you need something not covered in that book, it’s not like most of us don’t already own the rule books to a dozen other closely related retroclones. Yeah, the book's finished when it's finished. I think it's pretty clear that "January 2019" was picked out of nowhere; I do think James thought the book would be done by now, but I don't think it was ever intended as a proper deadline. At least now we know what the Flame Princess is Lamenting about - her book never came out!